Do you want to see how a novel gets edited? As you may have noticed, I’m an editor plus an author. I’ve published three of my books this year alongside working with amazing clients around the world to edit or coach them on their books. I edit on an almost-daily basis and wanted to restart September by blogging more regularly about editing. But I want to do something a little out-of-the-box. I’d like to show you exactly how I edit manuscripts. Not with one passage from a short story or the opening of one chapter. But with an entire novel. Yes. I am editing an entire 74,195-word novel on this blog. And will share it with the folks on medium.com, too. And as it’s one of my old novels, I will then publish it on CreateSpace, Amazon Kindle, and all of the other e-reader platforms through Draft2Digital. I’m going to make the cover on Canva and show you how to write and edit a blurb to help gain more visibility. I’m going to do all of that to show you what I do as editor deluxe and how it’s possible to take a bad novel and turn it into a great (hopefully), published (definitely) novel. And trust me, my novel is bad. I wrote it in 2000-2001 – which, if you’ve read my memoir Xamnesia: Everything I Forgot in my Search for an Unreal Life, was in the midst of my “unreal life” years. Ooooh, messy days. My great premise for my second novel was executed in a lousy way. And I couldn’t see my manuscript for the painfully clever words in it. This is a common issue I see in my editing work. People have brilliant ideas, but it takes clarity to weed out the guff, get the storyline right, develop living breathing characters, and hack out the painfully clever, or just draggy, bits. The writing doesn’t live up to the premise. I see this also in amazon reviews: readers crave a well-written story, not just a hook, a cute cover, and a surprising ending. My novel suffers from all of these maladies and more, so by showing you how I edit it, you can see in action how I journey with authors to make their book the very best it can be as an editor who cares deeply about story and the writing process. I know, I know… we writers can’t/shouldn’t edit our own work. But this is a 14-year-old manuscript so I assume that by now I will be able to see the rubbish from the rubies. I just read the first page and it turned my stomach. This baby is getting edited. Friday 27 November… Black Friday 2015! Just in time for Christmas shopping, if you do that sort of thing. And yes, it will be a Christmas-themed holiday novel. In fact, it’s going to be a quirky romantic Christmas-themed novel. A time travel, quirky, romantic comedy, Christmas-themed holiday novel. Set in Paris!!!! That’s some keywords right there that I reckon Amazon and the other e-book platforms will like-y like-y! 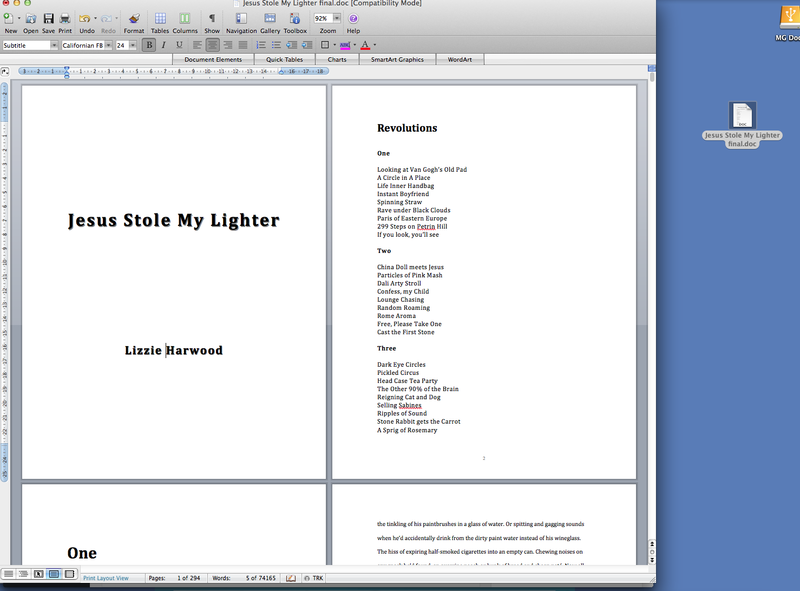 The Novel I will Edit Live on this Blog and then Publish in 2 months and 10 days. If you have good eyes, you’ll be able to read the word count: 294 Pages: 74165 words. That table of contents is real. (And really bad!) As for the title…. well “Jesus” is a character in this novel, but it’s still not a great title. 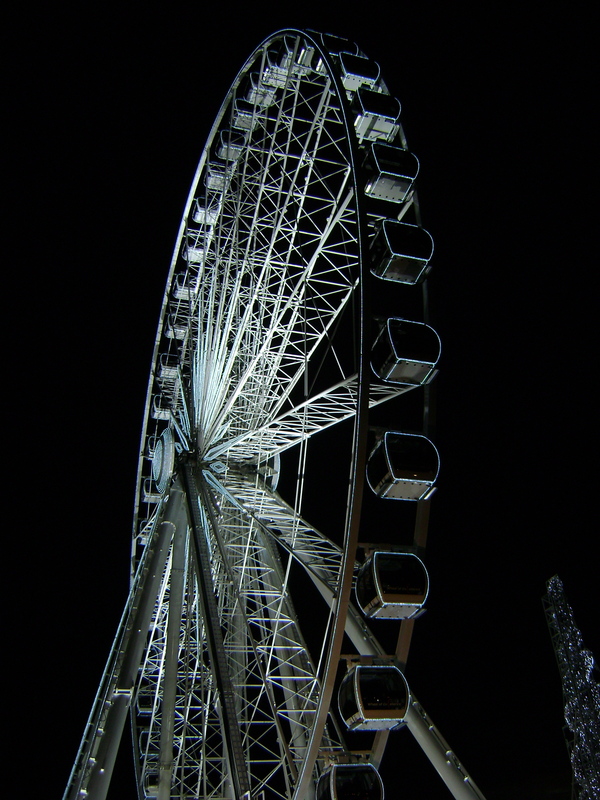 When this novel was on submission to publishers, it was called What Goes Around because the heroine, Sabine, goes on the Ferris wheel in place de la Concorde of Paris and spins into an alternate version of her life… where boyfriend complications ensue! Selfplug over, back to the title. Okay, that will never fit on a cover. I’ll work on it. Please share suggestions in the comments? This can be a group effort! And, I haven’t forgotten my pledge to my devoted readers (looking at you, Ari and Doing Dewey Decimal!) to show you how to make a hedgehog out of an old book. I made the hedgehog, took loads of photos, but ran aground finding googly eyes for him and then a deluge of editing work occupied me for the rest of summer! But now that my daughter received a Tricotins kit, I have a source of googly eyes, so I’ll be posting my How-To Hedgehog article very soon. Thanks, Vicki! This is a seriously bad piece of writing though, compared to my Xamnesia drafts – although draft one of Xamnesia was shockingly terrible and I let a friend send it to her über stellar agent, gah!!! Hindsight is so cruel in a way! I wonder if for the title you could dare to be more subtle about bf complixns and say Two Timing which relates to time and bf complixns. Hop on hop off also springs to mind but is too vague. Spinning around the Paris Wheel to land in love times two??? Good titles, Jac!!! Quite like Two Timing: A Paris Christmas Time Travel Tale maybe?